I was looking for Mary Enig's "Know Your Fats" on the bookshelves a couple of days ago and came across my unopened copy of Edward Tenner's "Why Things Bite Back" next to a 2/3 read copy of "Mistakes Were Made", an unopened copy of Desolate Landscapes and a recently arrived copy of Prothero's Evolution. John Peel's biography is part read (fascinating and sad to watch the progress of metabolic syndrome through the illustrations!). I have two novels from my daughter, unopened since Christmas and there's my wife's copy of Neverwhere that I'd love to read. I also keep getting emails from Lovefilm to ask why it takes me a month to watch "Iris". This is trying to tell me something. I've also finally accepted to an invitation to speak to a group on diet and health in the near future, which will be a fair undertaking. Plus we have to have the house sold by the end of July which is not a minor objective. So I think I may be going to have to take a bit of a sabbatical from blogging in the next few months, until we are settled in to wherever the post PhD job market takes us and I have found work too. 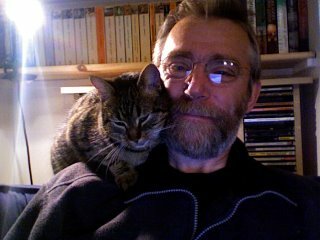 Sorry for this, but stuff creeps up on you and you need to think, read and live, as well as blog! EDIT: The comments thread on this post has been used by a proponent of a particular view of life which is labelled, by them self, as the HED, the High Everything Diet. I'm leaving the comments in place as they are fascinating in their own right. A reasonable but slightly overgeneral idea of what I personally feel is going is available here. Please bear in mind that it looks like, while the proponent is mentally unwell, he is also very intelligent and it's YOUR health that YOU are playing with. Play safe on the net. 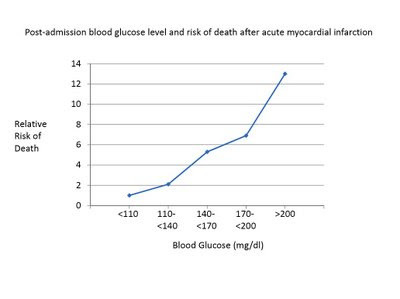 I've just plotted the risk of being dead in the near future vs post admission glucose for coronary patients in this study. Haven't seen the full text so I've no idea whether there was an acute drop in LDL cholesterol in the survival patients, to keep cardiologists happy, but I guess not or they would have mentioned it. In fact, if you had to guess, you could do worse than to guess that an acute drop in LDL would come accompanied by a black cloak and scythe. Anyway here are data from the abstract in graph form. Enjoy. Although it is possible the hyperglycaemia is the problem per se, it is equally possible that it simply reflects underlying insulin resistance. But I doubt anyone is going to ask for an IV glucose infusion plus some diazoxide post MI to find out! 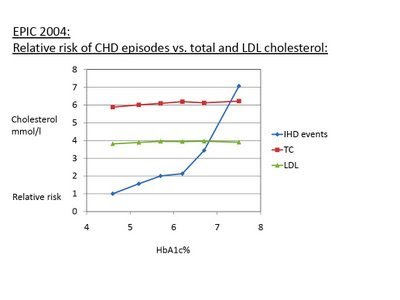 These are the slides from the within-countries discussion on cholesterol and heart disease. I've allowed the sarcasm back in, which was strictly limited when the slides were originally presented. OK, there is a correlation. In fact, if you are a bloke, having a cholesterol above that certain magic number on the graph is clearly catastrophic and boy, are you in trouble. No statins to save your life in those days! But what is the mystery number which sentences you to cardiac death? 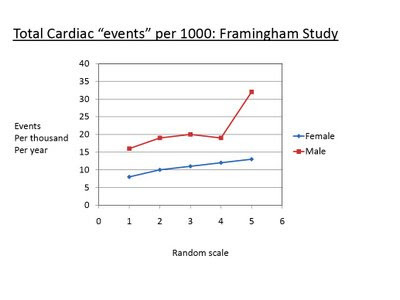 Obviously the original Framingham study did not use a random scale. But the scale used in the study was highly non linear. Here is the same graph with the real numbers added. Once you have realised quite how unlinear the scale is I would just like to draw your attention to that number on the bottom right written in RED. No, it's not a typo. That really is 1124mg/dl. Okaaaaaaaaay. 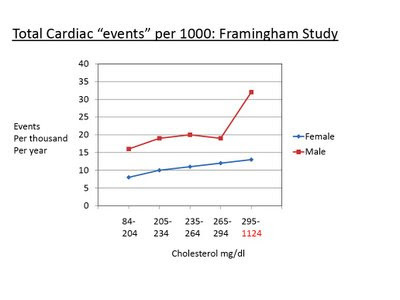 Hands up if you think a TC of 1124mg/dl is part of a normal distribution of cholesterol values in a "normal" population. Are there any conditions which elevate cholesterol and increase the risk of heart disease? Answers on a postcard to any endocrinology department you happen to know the address of. Ah, that's better. Some semblance of honesty now. But again, not quite as convincing as the first graph. BTW did anyone notice that the left hand scale was events, not deaths? Did the Framingham investiators look at deaths? Hahahahahahahahahahahaha bonk. Sorry, that's me laughing my head off. Of course they did. There is no association between elevated cholesterol and increased cardiac deaths, but the trend is that high cholesterol is protective. 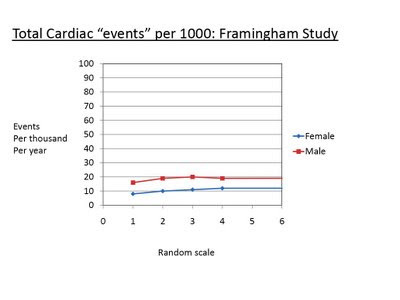 Luckily for the Framingham researchers they were underpowered to detect this. A whiff of the low powered studies we see nowadays. Now let's just look at the MRFIT screenees. These are the many, many people who were looked through before cherry picking the victims for the MRFIT intervention trial which, incidentally, killed more people in the intervention group than died in the the usual care group. Luckily (again) this did not reach statistical significance, though it may have been of some biological significance to those extra people who ended up dead in the intervention group. 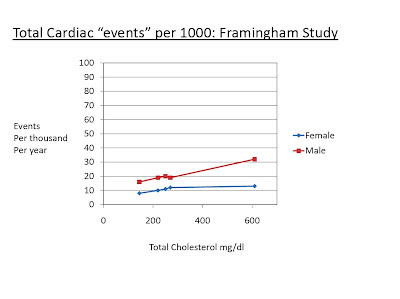 The original study had non linear group sizes (like Framingham) to specifically, oh, I mean accidentally, obscure the effects on all cause mortality in the low cholesterol individuals. The graphs above are taken from a later sub-analysis by a rather more honest and objective lead researcher. Such people do exist in cardiology. It wasn't corrected for smoking! Yet another re-analysis shows a marked association between TC and cardiac deaths, but only in smokers. About what you would expect if LDL cholesterol was doing its best to repair smoking induced damage and failing. The association is still present in non smokers and is statistically significant but so much weaker that the biological significance is highly debatable. It probably represents sucrose intake. 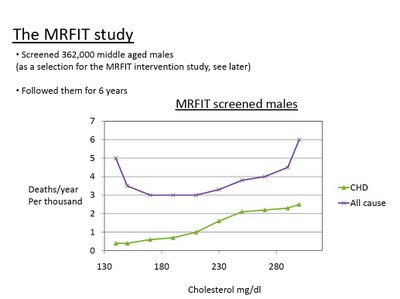 So in summary, the original MRFIT screenees study (presented as the clincher for cholesterol causing heart disease) obscured the scary aspects of low TC and, err, forgot to correct for smoking! Don't you love the foundations of modern cardiology! Can't sum up MRFIT better than Dr Werko. For a breath of fresh air it's worth going to Norfolk in the UK. 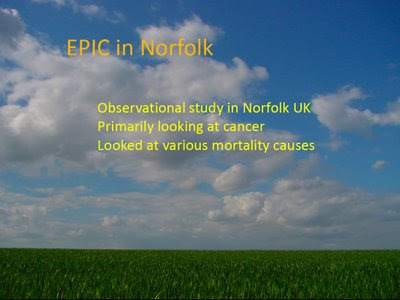 This innocent little graph is plotted from the EPIC Norfolk data. Now I'd hate to suggest that being hyperglycaemic has anything to do with heart disease, but you can read the graph as well as I can. Association not causation. And of course we know that eating fat causes hyperglycaemia, just ask any diabetologist. Shrug. The weird thing about UK researchers is that they give you the raw data, it's not a matter of a little table of regression coefficients corrected for this, that and the other. You can read the results tables and plot the graphs. They even give you raw smoking data. And of course you get both TC and that evil killer, the LDL level. 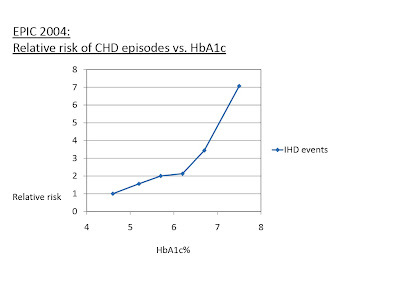 Let's plot them on the same graph as the HbA1c vs relative risk of cardiac events. Personally I'd be looking to minimise my HbA1c rather than my LDL-C. I can just lift one end of this railway sleeper and lever it to above my head. My workouts consist of moving moving it about. I spend about 30-60 seconds a day doing this. Been doing it for about a week and, despite muscle gain, I've dropped below 64.0kg for the first time in ages. I'll give it a month and see how I feel. So much for using exercise to gain weight! This paper came my way via Eddie Vos, through a discussion in the THINCS group. "The described study was conducted in an especially isolated wing of the California Medical Facility (CMF), a state institution for adult male felons. The isolated area included large indoor recreation, lounge, and shower areas, and 24 individual cells, and was so located as to prevent completely the passage of any food through or near the area." And what yummy food did the inmates receive? "These diets were unique in that a) their essential and nonessential nitrogen source was provided exclusively in the form of optically pure L-amino acids and b) they were administered as single, crystal clear aqueous solutions that were nutritionally complete in themselves. In essence, the diets were composed of balanced (but varying) proportions of L-amino acids, the required water-soluble and fat soluble vitamins, the pertinent mineral salts, glucose or other simple sugars as the source of carbohydrate, and ethyl linoleate as the source of essential fat." Apparently the various versions of the diet all tasted disgusting, for want of a better word. Apart from the interest of human experiments along these lines, there were a few other tweaks they applied. First we have to note that these diets were essentially ultra low fat diets, the same family as the diets used by McDougal and co. There is not a grain of white rice which does not end up as blood glucose. If you eat brown rice there is a split between the fibre and the minerals it is depriving you of (you know where they get flushed) and the starch, which ends up as blood glucose. So these are seriously low fat, high carbohydrate diets. What happens when you feed an elemental diet based on glucose alone as its calorie source? 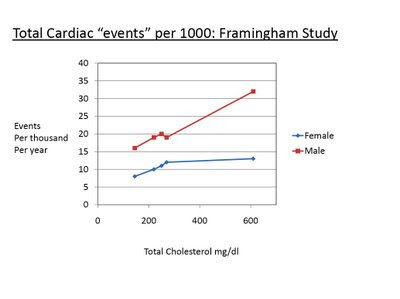 Blood cholesterol drops, from a normal value found in a non statinated male of 227mg/dl (while eating 1970s style prison food), to a cardiologic near Nirvana of 160mg/dl. Replacing 25% of the glucose with sucrose produces a rise in cholesterol to 208mg/dl. Removing the sucrose and going back to pure glucose drops the cholesterol level back down to 151mg/dl. A quick pubmed looking for a reference to fructose and insulin resistance (there are hundreds) produced this gem, hot out of cyberpublishing a few days ago. The group used an antisense oligonucleotide, which is a short section of DNA, RNA or a similar synthetic drug which specifically blocks the activity of a corresponding section of messenger RNA, which means the the relevant gene no longer gets successfully transcribed. By doing this they turned off lipid synthesis in the liver in response to fructose. No hepatic insulin resistance despite fructose intake: Wow!!!!!!!!!! Take this drug and you too can drink Pepsi Max without turning your liver in to foie gras. What else does it do? Oh, it lowers insulin resistance, whole body! Superb, give me some. "increased insulin-stimulated whole-body glucose disposal due to a threefold increase in glucose uptake in white adipose tissue"
Translation: "our wonder drug makes you fat". It is also described as a potential "treatment of NAFLD, hypertriglyceridemia, and insulin resistance associated with increased de novo lipogenesis", I would add "by making you fat". I'd also add that this de novo lipogenesis can easily be avoided by avoiding the fructose in the first place. What is not remotely obvious from the abstract is: Where does the fructose go to, if it's not used to converted your liver to foie gras? I guess it's either going to glycosylate your liver (sounds great for longevity) or spill in to your systemic circulation, where it can glycosylate whatever it come in to contact with.... Or it might just overload each liver cell with more pyruvate than it knows what to do with. Now there's grist for the mill of unintended consequences! A fructose intake of 12% of your calories makes your metabolism unhappy enough that it has evolved a technique to increase cholesterol levels under these rather rare (until recent times) conditions. It probably has knock on effects through hepatic insulin resistance resulting in hyperglycaemia and all of the damage that this leads to. While some fructose is perfectly OK (I too eat home grown fruit in season and a certain amount of sucrose) I suspect a large amount is not OK. Under highly defined conditions, fructose raises your total cholesterol level. EDIT: Sue has pointed out, off blog, that the other reason for a fall in cholesterol is due to minimal production of triglycerides. If glucose is being consumed within the ability of the liver to store it as glycogen there is no reason to convert it to fat and so there is no fat to export as triglycerides. Fructose immediately converts to fat and any fat produced in excess of the needs of the liver will be shipped out as LDL precursor particles, raising both LDL and TC. Both mechanisms are fructose related but not fructose specific. The average trigs were 93mg/dl but the study did not split anything other than TC by the sucrose/fructose periods early in 19 weeks of the initial part of the diet. The volunteers remained pretty well weight stable throughout, as far as I can see. So you have a choice of two mechanisms, there may be more, but the association still seems to hold that TC is a marker of fructose intake, with a number of confounders once you get off of chemical diets. BTW the TC went back to a normal >200mg/dl on return to normal food. Or uless you have a TC like mine (and a few other folks), which is a law unto itself. It seems that the FSA is suggesting that eating enough fructose will make a maggot eat your heart out! Some sense at last. Oh no! They think that apples are GOOD for you. But a maggot has certainly eaten a heart out of the apple... I suppose it's as accurate as suggesting that the temperature-drop induced phase change from liquid to solid of saturated fat, the one which blocks drains, will also block your arteries. Perhaps the FSA has a heart of ice! My taxes are paying these idiots' wages! "What the apple hates anthropomorphically is the relentless human selection that gives rise to the grotesque size and fructose content of its fruit"
I love the concept of apples as grotesque!